In 1899, when he was 43 years old and already renowned for his amazing inventions, Nicola Tesla submitted to an interview with journalist John Smith for the magazine Immortality. The interview was conducted in Tesla's laboratory in Colorado Springs. What was published was the transcript of the interview, exactly as the questions were raised and Tesla answered them. He obviously spoke in broken English which is reflected in some of the phrasing. What appeared in print that year was a rare and unique look at the spiritual, philosophical, and very personal side of a most amazing man who changed the way the world operates. Tesla was born in Croatia in 1856. He came to the United States as a young man where he excelled as a physicist, inventor, electrical engineer, mechanical engineer and futurist. He is best known as the inventor of alternating electrical current but his other achievements included electric lighting, X-rays, radio transmission, remote control, electric motors, the laser, wireless communications and limitless free energy. Other men have claimed credit for some of these inventions, but the record shows that Tesla had them first. Tesla was a poverty striken genius who was forced to rely on others to finance his research. Consequently men like J. P. Morgan, John D. Rockefeller, claimed the credits for much of his work, and he died a pauper in New York in 1947. Yet his personal philosophy of life and accomplishment was undaunting, as revealed in the 1899 interview. When talking about his life Tesla said: "I enjoyed every day and night. Write down: Nikola Tesla was a happy man . . .Wrote that Mr. Tesla played. He played the whole of his life and enjoyed it." He talked about his personal philosophy, in spite of the setbacks caused by his personal poverty and dependence upon wealthy and powerful people to finance his projects. Tesla said: "Do everything that any day, any moment, if possible, not to forget who we are and why we are on Earth. Extraordinary people who are struggling with illness, privation, or the society which hurts them with its stupidity, misunderstanding, persecution and other problems which the country is full of. Swamps with insects leaves behind unclaimed until the end of the work. There are many fallen angels on Earth." Tesla said he had visions of the things he was going to invent even as a child. He said: "For most of my discoveries I knew in my childhood that I will achieve them, although not entirely apparent . . . The light was always on my side. "Do you know how I discovered the rotating magnetic field and induction motor, which made me become famous when I was 26? One summer evening in Budapest, I watched with my friend Sigetijem (a) sunset. Thousands of fire was turning around in thousands of flaming colors. I remembered Faust and recited his verses and then, as in a fog, I saw spinning magnetic field, and induction motor. I saw them in the sun!" Mr. Smith brought up a report by a hotel service that they heard Tesla talking to himself in his empty room during a thunder storm. Tesla answered: "I talk with lightning and thunder. Tesla said: "I am part of a light, and it is the music. The light fills my six senses: I see it, hear, feel, smell, touch and think. Thinking of it means my sixth sense. Particles of light are written note. O bolt of lightning can be an entire sonata. A thousand balls of lightning is a concert. "Electricity I am. Or, if you wish, I am the electricity in the human form. You are electricity too Mr. Smith, but you do not realize it." Smith asked: "Is it thus your ability to allow fails of electricity of one million volts through your body?" Tesla: "Imagine a gardner who is attacked by herbs. This would indeed be crazy. Man's body and brain are made from a large amount of energy; in me there is the majority of electricity. The energy that is different in everyone is what makes the human "I" or "soul." For other creatures to their essence, "soul" of the plant is the "soul" of minerals and animals. "Brain function and death is manifested in light. My eyes in youth were black, now blue, and as time goes on and strain the brain gets stronger, they are closer to white. White is the color of heaven. Through my window one morning landed a white dove, which I fed. She wanted to bring me a word that she was dying. From her eyes the light jets were coming out. Never in the eyes of any creature had I seen so might light as in that pigeon." Tesla disagreed with Einstein's Theory of Relativity. He said: About Pythagoras and mathematics a scientist may not and must not infringe of these two. Numbers and equations are signs that mark the music of the spheres. If Einstein had heard these sounds he would not create theories of relativity. These sounds are the messages to the mind that life has meaning, that the Universe exists in perfect harmony, and its beauty is the cause and effect of Creation. This music is the eternal cycle of stellar heavens. "The smallest star has completed composition and also, part of the celestial symphony. The man's heartbeats are part of the symphony on the Earth. Newton learned that the secret is in geometric arrangement and motion of celestial bodies. He recognized that the supreme law of harmony exists in the Universe. The curved space is chaos; chaos is not music. Einstein is the messenger of the time of sound and fury." In another part of the interview Tesla said: "In every corner of the universe exist energy of life; one of them is immortality, whose origin is outside of man, waiting for him. The universe is spiritual; we are only half that way. The Universe is more moral than us, because we do not know his nature and how to harmonize our lives with it. "I am not (a) scientist; science is perhaps the most convenient way to find the answer to the question that always haunt me, and which my days and nights turned into fire." In his early writings Tesla referred to "cosmic pain." Smith asked him to explain this. His answer: "It is an illness whose existence the vast majority of people are not aware of. Hence, many other illnesses, suffering, evil, misery, wars and everything else that makes human life an absurd and horrible condition. This disease cannot be completely cured, but awareness shall make it less complicated and hazardous. "Whenever one of my close and dear people were hurt, I felt physical pain. This is because our bodies are made as of similar material, and our soul related with unbreakable strands. Incomprehensible sadness that overwhelmed us at times means that somewhere, on the other side of this planet, a child or generous man died. "The entire Universe is in certain periods sick of itself, and of us. Disappearance of a star and the appearance of comets affect us more than we can imagine. Relationships among the creatures on the Earth are even stronger. Because of our feelings and thoughts the flower will scent even more beautiful or will fall in silence. "These truths we must learn in order to be healed. Remedy is in our hearts and evenly, in the hearts of the animals that we call the Universe. "There is general knowledge and truth that man has always possessed. In my feeling and experience, the Universe has only one substance and one supreme energy with an infinite number of manifestations of life. The best thing is that the discovery of a secret nature reveals the other." he said. Tesla also spoke about the laws of the Universe. He said: "Matter is created from the original and eternal energy that we know as light. It shone and there have been appear star, the planets, man and everything on the Earth and in the Universe. Matter is an expression of infinte forms of light because energy is older than it. "There are four laws of Creation. The first is that the source of all the baffling, dark plot that the mind cannot conceive, or mathematics measure. In that plot fits the whole Universe. The second law is spreading a darkness, which is the true nature of light, from the inexplicable and it's transformed into the light. The third law is the necessity of the light to become a matter of light. The fourth law is: no beginning and no end; three previous laws already take place and the Creation is eternal." When Smith said he did not understand Tesla's statement, Tesla responded: "Why would you need to understand? Suffice it to believe it. Everything is light. In one its ray is the fate of nations; each nation has its own ray in what great light source we see as the sun. And remember: no one who was there did not die. They transformed into the light, and as such exist still. The secret lies in the fact that the light particles restore their original state." Smith then exclaimed: "This is the resurrection!" Tesla answered: "I prefer to call it: return to a previous energy. Christ and several others knew the secret. I am searching how to preserve human energy. It is forms of light, sometimes straight like heavenly light. I have not looked for it for my own sake, but for the good of all. I believe that my discoveries make people's lives easier and more bearable, and channel them to spirituality and morality." Tesla believed: "Everything that lives is related to a deep and wonderful relationship: man and the stars, amoebas and the sun, the heart and the circulation of an infinate number of worlds. These ties are unbreakable, but they can be tamed and to propitiate and begin to create new and different relationships in the world, and that does not violate the old. "Knowledge comes from space; our vision is its most perfect set. We have two eyes: the earthly and spiritual. It is recommended that it become one eye. Universe is alive in all its manifestations, like a thinking animal. "Stone is a thinking and sentient being, such as plant, beast and man. A star that shines asked to look at, and if we are not a sizeable salf-absorbed we would understand its language and message. His breathing, his eyes and ears of the man must comply with breathing, eyes and ears of the universe." When talking about his work, Tesla said he has always utilized imagination. "All my long life I spent in ecstasy. That is the source of my happiness. It helped me during these years to bear with work, which was enough for five lives. The best is to work at night because the stellar light and close bond. "I might have to thank visualization for all that I invented. The events of my life and my inventions are real in front of my eyes, visible as each occurrence or the item. In my outh I was frightened of not knowhing what it is. But later I learned to use this power as an exceptional talent and gift. I nurtured it, and jealously guarded it. I also made corrections by visualization on most of my inventions, and finished them that way. By visualization I mentally solve complex mathematical equations." 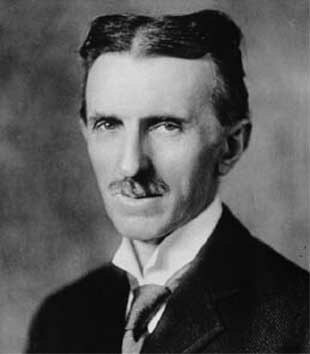 Tesla spoke of the use of dreams to solve complex problems. "From a long and exhausting work, which required superhuman effort, after one hour of sleep I'd be fully recovered. I gained the ability to manage sleep, to fall asleep and wake up in the time which I designated. If I do something what I do not understand, I force myself to think about it in my dream, and thus find a solution." Tesla said he never married because he chose to devote all of his life energy to his work. "The woman is the biggest thief of that energy, and thus the spiritual power," he said. He understood Kundalini Yoga and said he acquired this and other Hindu knowledge from birth. "Of myself I created what I wanted: a thoughtful and spiritual machine." In spite of his years of devoted work, Tesla was lamenting, even at mid-life, that we was "a defeated man. I have not accomplished the greatest thing I could. I wanted to illuminate the whole earth. There is enough electricity to become a second sun. Light would appear around the equator, as a ring around Saturn." After dealing with the greed and political powers that prevented him from achieving this marvelous goal, Tesla said he concluded that "mankind is not ready for the great and good. In Colorado Springs I soaked the earth by electricity. Also we can water the other energies, such as positive mental energy. They are in the music of Bach or Mozart, or in the verses of great poets. In the Earth's interior there are energy of joy, peace and love. Their expressions are a flower that grows from the Earth, the food we get out of her and everything that makes man's homeland. I've spent years looking for the way that this energy could influence people. The beauty and the scent of roses can be used as a medicine and the sun rays as a food. "Life has an infinite number of forms, and the duty of scientists is to find them in every form of matter. Three things are essential in this. All that I do is a search for them. I know I will not find them, but I will not give up on them." First: a stellar or terrestrial energy to feed the hungry, water the thirsty "so that they can cheer in their heart and understand that they are Gods." "Another thing is to destroy the power of evil and suffering in which man's life passes. They sometimes occur as an epidemic in the depths of space. In this century the disease has spread from Earth into the Universe. "The third thing is that there is an excess light in the universe. I discovered a star that by all the astronomical and mathematical laws could disappear, and that nothing seems to be modified. This star is in this galaxy. Its light can occur in such density that fits into a sphere small than an apple and heavier than our Solar System. Religion and philosophes teach that man can become the Christ, Buddha and Zoroaster. What I am trying to prove is wilder and almost unattainable. This is what to do in the Universe so every being is born as Christ, Buddha or Zoroaster. "I know that gravity is prone to everything you need to fly and my intention is not to make flying devices, but teach the individual to regain consciousness on his own wings . . . Further; I am trying to awake the energy contained in the air. There are the main sources of energy. What is considered as empty space is just a manifestation of matter that is not awakened. "No empty space on his planet, nor in the Universe . . . in black holes, what astronomers talk about, are the most powerful sources of energy and life," Tesla said.